Q. When did you join Lincad and what was your first job? I joined Lincad in 1995 straight from school with no clear career path in mind. To start with I worked in the factory, assembling products and performing general warehouse duties. Q. And what does your current job involve? As Lead Software Design Engineer, I’m responsible for the software architecture, algorithm design, coding, testing, configuration management and support of all new and existing products that contain embedded software, programmable logic or Windows user interfaces. Q. Could you describe a typical day? At any one time, I could be working on a single project or multiple projects, possibly overseeing contractors, or writing code for product software. This involves writing complex algorithms which have to be tested for bugs and rectified before the product itself is tested up to its full specification. If there are any problems with the software, it’s down to me to fix them. The process of taking a product through its full design cycle from concept to manufacture can take anywhere from a few weeks to many months depending on the complexity of the system. Q. It’s quite a progression from when you first joined Lincad; how did it come about? software and embedded systems engineering. Q. Can you tell us a bit more about the qualifications you now have and how you got them? B.Eng. Honours Degree in Electronic Engineering with an integrated foundation year and professional placement. Because of my involvement with Lincad before and during my time at university, I was able to tailor my degree towards my future career by focusing on particular modules, including Software Analysis and Design, C Programming, Power Electronics, Digital Design with VHDL and Mathematics. In 2008, I was awarded a 2.1 and won an AUS Distinction Award for Outstanding Industrial Placement. I’ve also gained full membership of the Institution of Engineering and Technology (IET) and Lincad is continuing to support me in working for Chartered status. Q. Are there other young people in Lincad pursuing a similar path to your own? degree level. Also, Daniel Parkin won an award from the University of Surrey last year for his achievements during his industrial placement at Lincad and will be continuing to work for the company during his holidays. 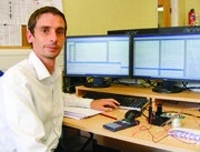 Hopefully he will return to work for Lincad full time when he has completed his M.Eng. Degree in Electronic Engineering. Q. What would you say to other people who may be thinking of applying to Lincad? flexibility we need to evaluate new technologies and software platforms. As a result, the company is able to evolve and produce ever more sophisticated power systems resulting in superior products for our end users.